There is no better way to experience Israel’s magic than on a horseback! The unique combination of fascinating history, breathtaking scenery and sunny weather make Israel the perfect tourist destination. Sirin Riders, the only horseback riding vacation operator in Israel, offers all-included riding vacations. We provide an exhilarating and captivating tour of Israel: its history, peoples and nature. Outside of the air-conditioned tour bus, you will meet an authentic Israel, can savor the fresh desert air, appreciate the rocky terrain of the Galilee and admire the views from biblical mountain tops after a long ride. Our staff is skilled horsemen, specializing in trail riding, we combine our passion for horses with a deep knowledge and love of Israel. Together with well-trained horses, we will provide you a riding adventure of a lifetime! Sirin Riders from Eyal Bartov on Vimeo. Celebrate the New Year where it all began! 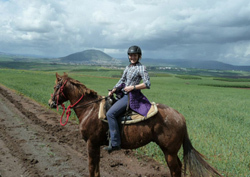 Welcome in 2019 on our Tour Israel trip – a remarkable, unique horseback riding experience. Click here to sign up, space is limited.